Is the iPad Suitable for Playing Online Poker? Steve Jobs, one of the biggest IT gurus of our time, showcased and released a new product for his company Apple this January. The iPad, the bigger brother to the iPod, could not only have a positive effect on Apple’s sales, but maybe also on online poker. 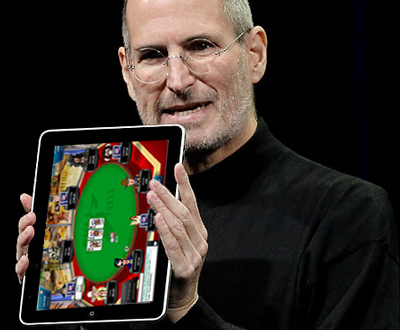 Is Steve Jobs ready to give up Apple and begin a poker career? Basically, the iPad is a bigger and better performing iPod and considering this it makes it a prime launch tool for online poker. The screen has a dimension of 9.7 inches and supports the resolution of 1024x768, about the same as a reasonable price netbook. But where the iPad comes out stronger is with its sleek and ultra-thin design, as well as touch capabilities. Although the professional online poker players playing multiple tables would never consider using the iPad for poker, it could be an alternative solution for hobby players and travellers. The only problem that faces the iPad being a platform for poker is that no.1 market for Apple is the United States, where the Unlawful Internet Gambling Enforcement Act (UIGEA) will dampen its glory. Apple has a reputation to take it seriously when it comes to stability and clarity of all its platform software. This is why you can find that Apple only uses its own software (available for download in the Apple Store) and none of these show interest in supporting the online gambling world. Of course, when there is an obstacle, there is always a solution to get around the problem. This time it could take form in the remote-viewer function, with which we can connect to our home PC or Mac and use all the software pre-installed on it. Using this solution, we can play poker on the iPad, but because of connection speed and lack of support, players will tend to find it quite glitchy. Another promblem concerning the iPad is its lack of support for Flash, which can make everyday web surfing an unpleasant experience and also a problem at some of the poker rooms, that require Flash support. Would you play online poker on your iPad?